For the second straight week, the Niners defense dominated, keeping once again an opponent out of the end zone as they pounded Ryan Fitzpatrick and the Buffalo Bills 45-3. The win puts the Niners at 4-1 on the season, and it seems like the loss to the Vikings a few weeks back could have been the wake up call this team needed. The Bills had no answers for 49’ers QB Alex Smith, who was nearly perfect through the air. Frank Gore had his way on the ground as the Niners did as they pleased on both sides of the ball. Smith went 18-of-24 passing for 303 yards and three touchdowns, while Gore ran for 106 yards and a score on 14 carries for the 49ers, who gained a franchise-record 621 yards in their second straight blowout victory. Fitzpatrick finished with just 126 yards and an interception for Buffalo, which came in with an NFL-high 16 touchdowns but gained just 10 first downs in its second straight debilitating setback. The Bills gave up 45 second-half points in last week’s loss to the Patriots and again had no answer for a 49ers team clicking on all cylinders. Sunday’s game shifted five minutes into the second quarter when Smith found Kyle Williams down the right sideline. Williams was tightly covered, but came back for the underthrown pass and made two defenders miss en route to a 43- yard TD that broke a 3-3 tie. 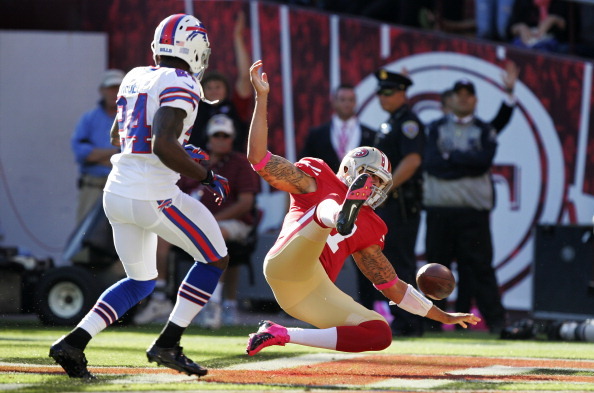 It was over from there, as the Niners outscored the Bills 28-0 in the second half for the runaway win. Next weeks it’s the rematch Niners fans have been waiting for, as the Giants come to town for a rematch of last seasons NFC Title game. Be the first to comment on "Niners Blow Out Bills 45-3 to Improve to 4-1"